It is authorized to use physical force. This month, Ford was granted a patent for an autonomous police car. The car can work in cooperation with a human officer or by itself, and it can tell when a traffic law has been violated and act accordingly. These may be described as “autonomous police vehicles,” but I’m just going to say what we’re all thinking: This is RoboCop. The autonomous police officer can use one of the connected sensors to figure out if there’s been a violation. For simple warnings and speeding tickets, the vehicle can just capture an image of the license plate. 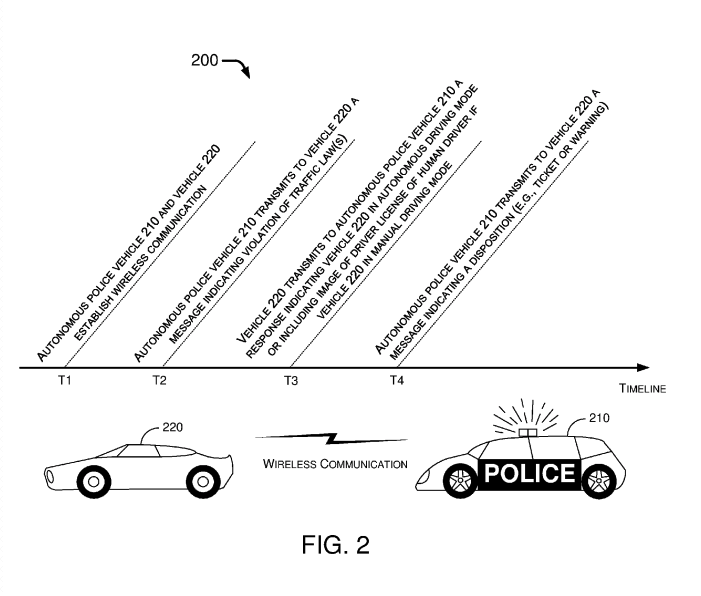 The figure below, which was taken from the patent, establishes how exactly a police car could communicate with an offending vehicle. It’s important to note that Ford receiving the patent for this technology doesn’t mean the company will actually pursue it. It just leaves the option open and ensures that no one else can develop it in the mean time. While the idea of a robot police officer (or RoboCop!) might be mildly terrifying, the technology is already being used in countries like Dubai and Singapore. It’s not a stretch to imagine it might come to US streets as well. Would human enhancement create Supermen or super tyrants?